This equipment is designed for the commercial production of Embossed Film for Security Holograms and allied Products, using PET & Hot Stamping Foils of various thicknesses from 18µ. and upward. 7. Digital Temperature Controller : Individual Temperature Control for 3 Nos. Individual Roller. 8. Embossing Speed : 45 Meters/ Minute (Max) Depend upon the Materials. 11. Electronic Speed Indicator : Included. 12. Electronic Panel Counter : Included. 13. 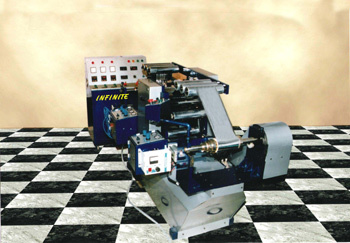 Embossing Roller Pressure Control : Pneumatic System Adjustable. 14. Embossing Rollers : Two Nos. Pressure Rollers & One Shim Roller all D2 Metal. 15. All Spare Parts : Electrical & Pneumatic CE Certified.